Theme Park Insider has been covering Universal's Wizarding World of Harry Potter since before the first land was announced. Follow the links below for highlights from our on-going coverage of the four lands. The original Wizarding World soft-opened in late May 2010, following a 2007 announcement that Universal has secured the theme park rights to J.K. Rowling's characters and would be bringing them to the Universal Orlando Resort. Themed to the village of Hogsmeade from the Harry Potter books and films, original Wizarding World land was designed by Universal Creative in consultation with author J.K. Rowling and Harry Potter film production designer Stuart Craig. It includes one new attraction, Harry Potter and the Forbidden Journey, as well as two rethemed rides and multiple shops and restaurants. In December 2011, ThemeParkInsider.com first published plans for a second Wizarding World of Harry Potter, to be themed to Diagon Alley. Located in Universal Studios Florida, this second Harry Potter land is connected to the original Hogsmeade-themed Wizarding World via a Hogwarts Express train that runs between the two theme parks. Universal confirmed the construction of the new land in May 2013. The centerpiece is the Gringotts Bank, which houses Harry Potter and the Escape from Gringotts. The new land opened officially to the public on July 8, 2014, following a media preview on June 18-19, 2014. How will Harry Potter and the Escape from Gringotts differ from Spider-Man and Transformers? 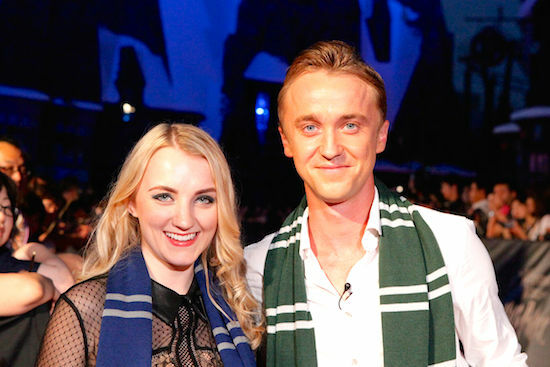 Evanna Lynch (Luna Lovegood) and Tom Felton (Draco Malfoy) on the red carpet in Osaka. Photo courtesy Universal Studios Japan. In 2012, before Universal confirmed plans for a second Harry Potter land at Universal Orlando, the company confirmed that it would bring the Wizarding World of Harry Potter to Universal Studios Japan in Osaka. The Japanese Wizarding World debuted on July 15, 2014, following the Hogsmeade village design from Universal's Islands of Adventure and lacking only the Dragon Challenge roller coaster from the original land. The Southern California version of the Wizarding World was the first to be announced following the opening of the original Wizarding World in Orlando, but was the last to be completed, opening in 2016. The Wizarding World of Harry Potter is coming to Universal Studios Hollywood, but when? Get It All in Our Wizarding World Guidebook! 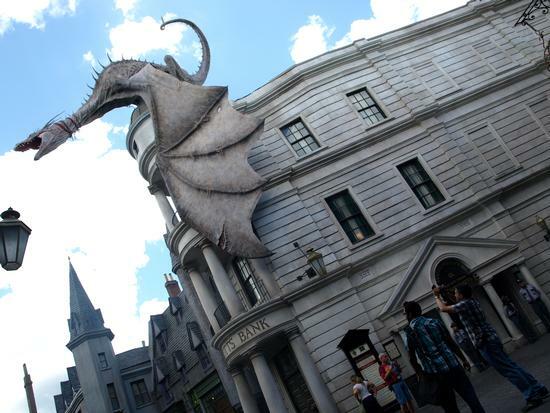 Our in-depth guidebook to Universal's Harry Potter theme park lands, Theme Park Insider Visits The Wizarding World of Harry Potter features detailed descriptions of all the rides, shops and restaurants in the these lands, plus tips for visiting them. This 63-page, 18,000-word booklet also tells you the history of the project and includes comments from the the lands' designers and from the stars of the Harry Potter films. It is available as an eBook for Kindle, iBooks, and Nook [$3.99] and in paperback [$5.99].